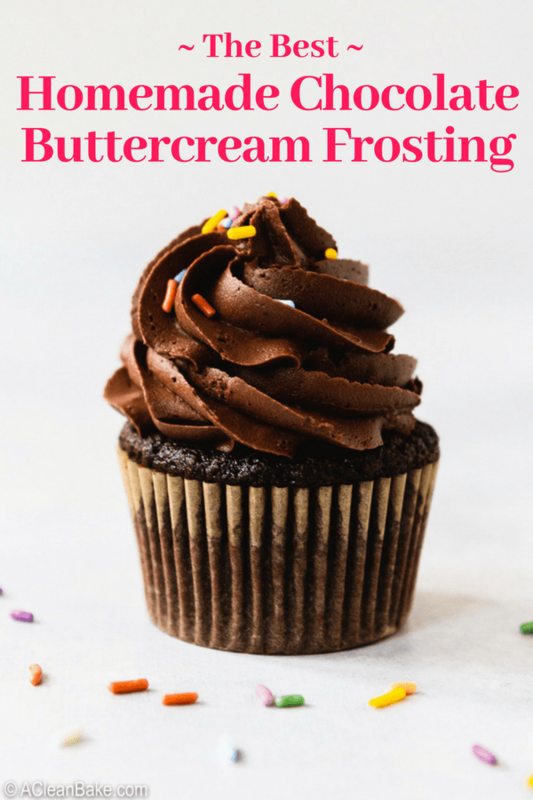 If you’re tempted to buy your frosting in a can, try this easy homemade chocolate buttercream frosting instead. You won’t believe how much better it is! 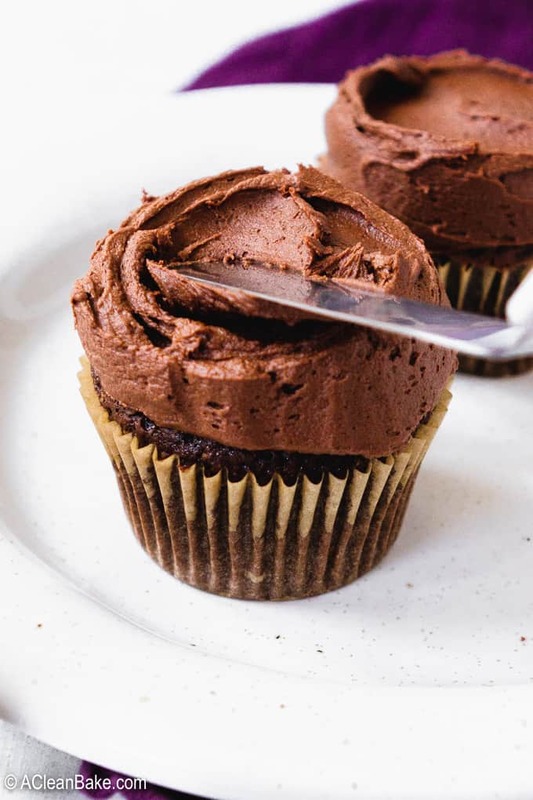 Although, unlike any other recipe on the site, this recipe contains powdered (cane) sugar, there is much less than in your standard chocolate buttercream frosting recipe, which yields a richer, chocolatier flavor without compromising on smooth and decadent texture. This frosting certainly isn’t an everyday recipe, but is sure to make your next celebration extra special! 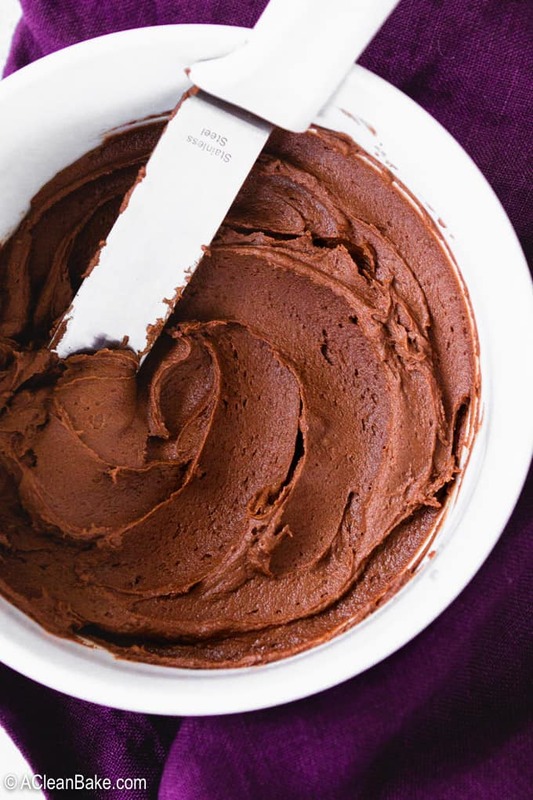 So many of you asked me for recipe for the rich, silky, unbeatable chocolate buttercream frosting that I used to finish my new favorite chocolate cake, but I didn’t post it with the original recipe because *gasp* it has powdered (cane) sugar in it. Here’s the deal: when I finally perfected the paleo chocolate cake I shared with you a few weeks ago, it was right around my dad’s birthday and, surprise, he requested a chocolate cake (it’s fate!) (I had also tempted him with several of the close-to-perfect-but-not-quite-there-yet-but-still-really-good test batches). But, I didn’t feel like going to the store to buy frosting, and anything I would have bought, even the stuff at Whole Foods, has powdered sugar in it. So, I figured, I may as well make some at home. I can tolerate some dairy now, and no one else I was going to be sharing the cake with is sensitive to sugar. So why not? 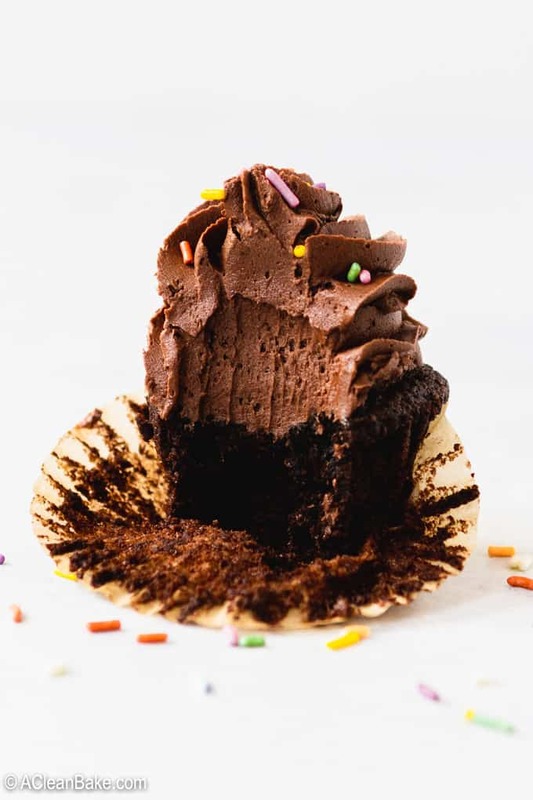 As I sifted through recipe after chocolate buttercream recipe, I realized why not: you would not believe the amount of sugar in these conventional methods. One recipe I looked at had 3 1/2 cups of powdered sugar!!! Just… no. So I winged it and am pretty happy with the results. Oh, and for the record, there is only 1 1/2 cups of sugar in the recipe, and it makes about the same amount of frosting as that 3 1/2 cups-of-sugar version! It’s a bit of a fussy ingredient list, but it will pay off in rich, pleasantly bitter, non-teeth-rottingly-sweet chocolate flavor and smooth and rich texture. Best of all, it pipes really smoothly, but also spreads effortlessly – like so👇- in case you don’t want to go to the trouble of washing a piping bag later! I most certainly do not want to leave out those of you who can’t tolerate dairy or sugar, but I haven’t had time yet to test other iterations of this frosting. So I will leave you with some suggestions, but I can’t guarantee that all of these subs will work perfectly, so proceed at your own risk! Unsalted butter: for a dairy free version, you can swap in non-hydrogenated palm shortening, softened to room temperature. Do not use salted butter instead of unsalted butter. Powdered cane sugar: this one comes with a big, big, big flashing red alert because I haven’t tried this yet, but there are a couple of brands out there that make powdered monk fruit and, theoretically, that should work. Lakanto is the brand I like to use. But I haven’t tried it myself yet, so I can’t guarantee that the texture or the flavor will be perfect. Sub at your own risk! Cocoa powder: use the best you can find. There is no sub for good quality cocoa power, and using the cheap stuff will definitely be noticeable in the flavor of the frosting! Milk: Most chocolate buttercream frosting recipes call for whole milk or heavy cream, but I prefer to sub full fat coconut milk. If using coconut milk, make sure it is warmed and shaken so that the fat is mixed in well and the liquid is smooth. I’ve tested this, so I’ve included this sub in the recipe! Salt: I know some of you are following low-sodium diets, so it can be tempting to remove the salt from recipes. But did you know that salt in desserts actually enhances the sweetness? Without a pinch of salt, the flavor might be flat or cloyingly sweet. All you need for the whole batch is a very small pinch, so it ends up being a negligible amount of sodium per serving. Vanilla extract: No subs here! As always, make sure to use pure vanilla extract, not the imitation stuff. There’s no question that this recipe contains more than a little bit of white sugar, which I know we are all very keen to avoid. But whether it is a family birthday or another special occasion, there is a time to throw the rules out the window in order to make your loved ones feel special. Nothing makes someone feel special like a homemade cake finished with homemade chocolate buttercream frosting – with or without sugar. Although this is certainly not an every day recipe, make sure to bookmark or pin it for your next special occasion! 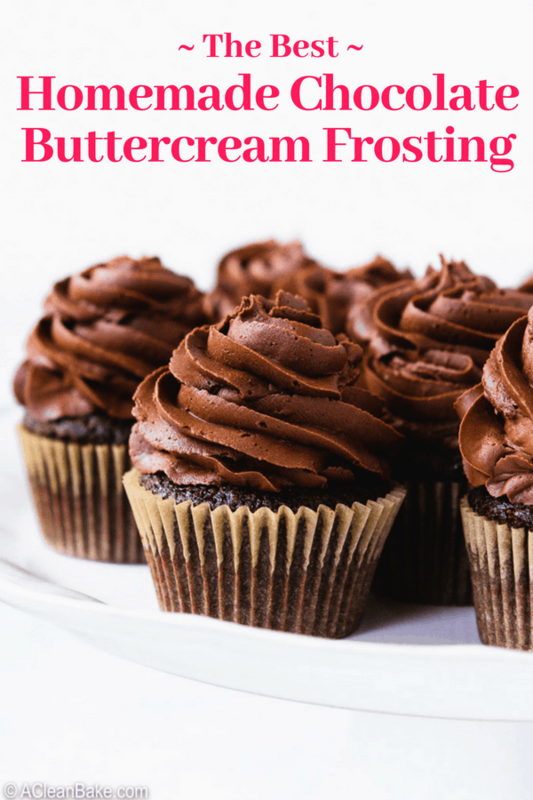 If you're tempted to buy your frosting in a can, try this easy homemade chocolate buttercream frosting instead. You won't believe how much better it is! 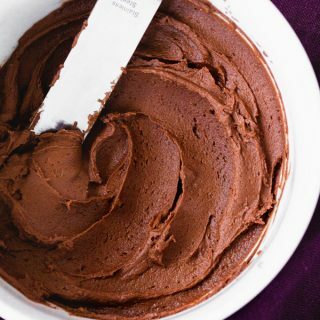 Although it contains powdered (cane) sugar, there is much less than in your standard chocolate buttercream frosting recipe, which yields a richer, chocolatier flavor without compromising on smooth and decadent texture. This frosting certainly isn't an everyday recipe, but is sure to make your next celebration extra special! In the bowl of a stand mixer fitted with the beater attachment (not the whisk), beat the softened butter until smooth. Turn off the mixer, scrape down the sides, and add sugar and cocoa powder. Mix on low to combine, then whip on high for about 2 minutes, until fluffy and lighter in color (should be the color of milk chocolate). Add the salt and vanilla, and the milk or cream (if needed to reach a spreadable consistency). Mix 30-45 seconds, to combine. This recipe makes about 2 1/2 cups, which is enough frosting for one double-layer 6" cakes, or one dozen cupcakes. If not using immediately, store in an airtight container in the fridge for up to 3 days. Bring back to room temperature and stir well before spreading or piping with it. I most certainly do not want to leave out those of you who can't tolerate dairy or sugar, but I haven't had time yet to test other iterations of this frosting. So I will leave you with some suggestions, but I can't guarantee that all of these subs will work perfectly, so proceed at your own risk! Powdered cane sugar: this one comes with a big, big, big flashing red alert because I haven't tried this yet, but there are a couple of brands out there that make powdered monk fruit and, theoretically, that should work. Lakanto is the brand I like to use. But I haven't tried it myself yet, so I can't guarantee that the texture or the flavor will be perfect. Sub at your own risk! 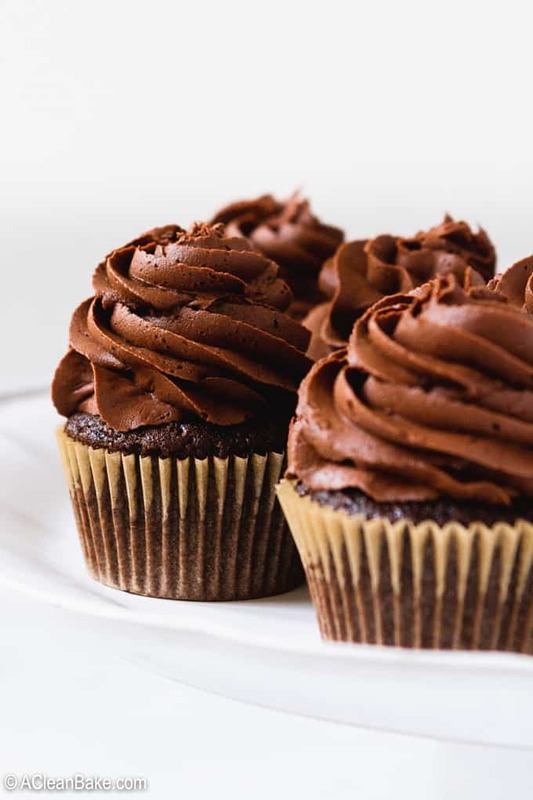 Milk: Most chocolate buttercream frosting recipes call for whole milk or heavy cream, but I prefer to sub full fat coconut milk. If using coconut milk, make sure it is warmed and shaken so that the fat is mixed in well and the liquid is smooth. I've tested this, so I've included this sub in the recipe!